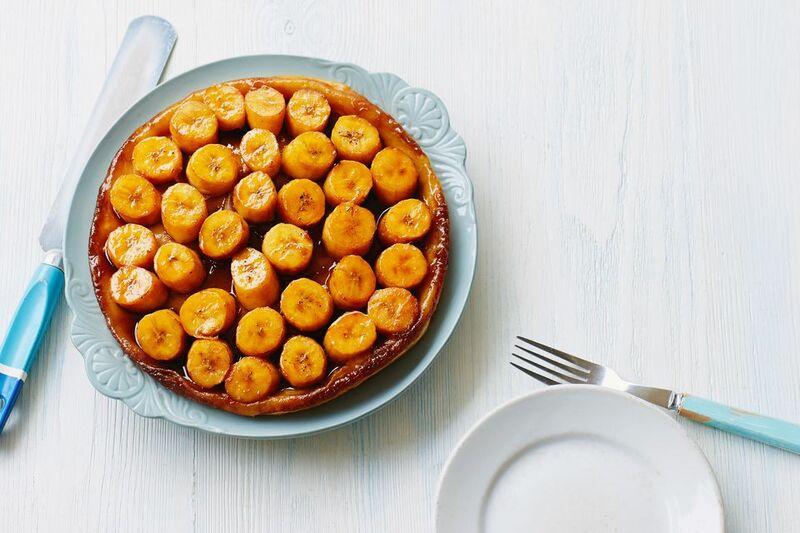 This banana tarte tatin recipe is an easy dessert to make on short notice. Ripe bananas are always in season and frozen puff pastry can be found in most major grocery stores. Pull the puff pastry out to thaw while you slice bananas and simmer the rum sauce. Best of all, this recipe is very forgiving. If you simply have no time to make homemade French rum sauce, use store-bought caramel sauce kicked up with a sprinkle of cinnamon. Melt the butter in a 10-inch ovenproof skillet. Add the rum sauce and bring to a simmer. Remove from heat and arrange the banana slices in a single layer in the hot rum sauce. Drape the pastry over the bananas, fitting the overhang up the sides of the skillet. Bake in the preheated oven for 22-25 minutes, until the pastry turns golden brown. Cool the tarte tatin in the skillet for 30 minutes before inverting it onto a serving platter. This banana tarte tatin recipe makes 8 servings.